Part of what makes PPOA a special place is the camaraderie established among our attorneys and administrative staff. This spirit creates a truly collegial environment and strengthens the quality of legal services that we are able to provide to our clients. We build our camaraderie through numerous and regular activities and events, including: sports teams, travel, various civic and charitable organizations, as well as just getting together on weekends for casual cookouts. 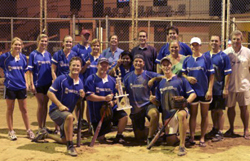 PPOA is proud to field a team each summer in the Louisville Bar Association’s co-ed softball league. Held at the friendly confines of Turner’s Field, summer softball has proven to be a great way to mix teamwork, fun, and interaction with our fellow Bar members. PPOA has a long history of success in the league. 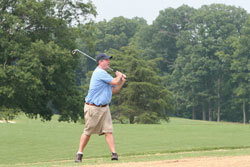 Despite stiff competition, PPOA has won championships in 2004, 2005, and 2010. 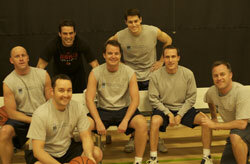 Competing in a law firm league, PPOA’s basketball team is widely recognized for its tenacity, hustle, and defense. PPOA has a number of sharp-shooters from the outside, and its success has been largely determined by its three-point field goal percentage. As such, PPOA players, coaches, and staff will be working hard to improve its presence in the paint over the next few years. While PPOA competes in a number of charity and client-sponsored golf tournaments, intra-firm competitions are the ones that really strengthen our bond (and sharpen our wits). Participants are encouraged to keep a USGA handicap or make a convincing case to “the committee” regarding what their handicap should be. While talent levels range from scratch golf to “I’ll take a 10,” every round is filled with camaraderie as well as competition. The highly coveted PPOA Cup, awarded annually and surrendered reluctantly, is placed prominently in the winner’s office to the envy of the other competitors. 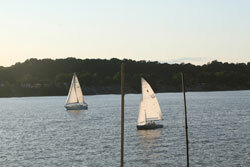 From the Ohio River to Key West and beyond, sailing is a favorite activity of a number of attorneys in our office. Having a licensed captain to lead the crew helps. Hemingway may have said, “A man is never lost at sea,” but without our captain, some of the crew would test this maxim.